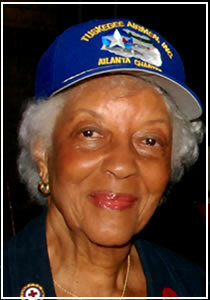 Irma “Pete” Dryden served in the Tuskegee Airmen program as a nurse at the Tuskegee air bases hospital. Dryden, whose nickname is derived from her childhood habit of wiggling her nose like Peter Rabbit. “Pete” considers her service as a Documented Original Tuskegee Airman among her proudest accomplishments. She has remained an active member of The Tuskegee Airmen, Inc., the nonprofit organization that preserves and teaches about the group’s legacy. She volunteered to serve as a nurse on base just after finishing her training at Harlem Hospital. She was 23 when she boarded a train in April 1943 to travel to the air base being built outside Tuskegee, Alabama. A New York City native, she had never experienced the Jim Crow racism of the south, but she and two fellow black nurses got their introduction after having to change to a segregated train in Washington, D.C. The train didn’t have a separate dining car for African-Americans, so Dryden and two fellow nurses were given strict rules about when and where they could eat their meals. They were to be only at certain times, and as they ate, a curtain was pulled around them so that the white passengers wouldn’t have to acknowledge the “coloreds” in their midst. To Dryden, that meant lending a sympathetic ear as well as bandaging a wound.